Ubicada en la costa Este se encuentra Dublín Capital de la República de Irlanda, en la provincia de Leinst. Es considerada la ciudad más grande de éste país, esta en la desembocadura del río Liffey y cuenta con muchos atractivos turisticos entre los cuales se mostraran tres de los lugares referenciales en esta primera oportunidad,como son: O´Connett Bridge, La Aguja y la Estatua de Molly Malone. 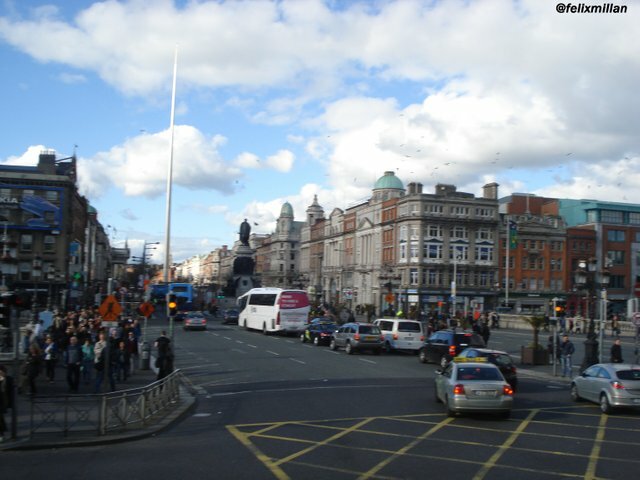 Located on the East coast is Dublin Capital of the Republic of Ireland, in the province of Leinst. 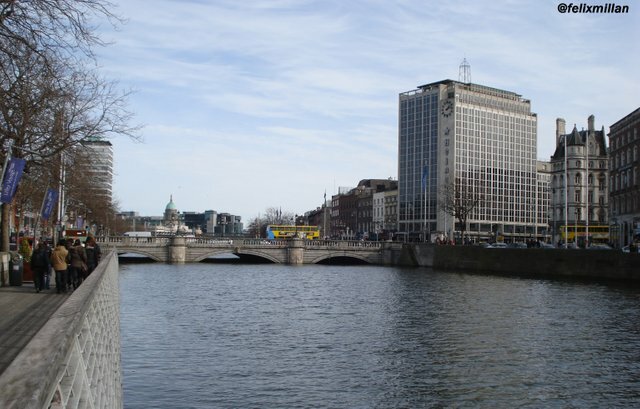 It is considered the largest city in this country, it is at the mouth of the Liffey River and has many tourist attractions among which three of the reference places will be shown in this first opportunity, such as: O'Connett Bridge, La Aguja and the Statue of Molly Malone. La aguja llamada The Spire of Dublin o Momumento de la Luz, ubicada en O´Connell, es un monumento en forma de aguja de mas de 100 metros de altura, de acero inoxidable fue diseñada por Ian Ritchie Architects, cuya base y parte superior estan iluminadas que proporcionan una baliza en el cielo nocturno de la ciudad. The spire called The Spire of Dublin or Momumento de la Luz, located in O'Connell, is a needle-shaped monument more than 100 meters high, stainless steel was designed by Ian Ritchie Architects, whose base and top are illuminated that provide a beacon in the night sky of the city. 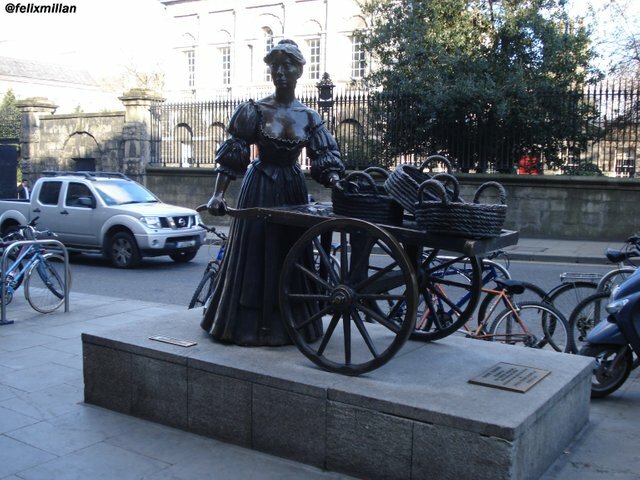 Esta estatua de bronce ubicada actualmente en Suffolk Street, Dublín, cuya leyenda se basa en la letras de varias canciones del siglo XVII, donde cuentan la historia de una vendedora ambulante de mariscos de día y una prostituta de noche, cuya familia se había dedicado a la pesca tradicionalmente ; contrariamente también se dicía que se trataba de una pescadora que vendía con un carro llenos de berberechos y mejillones y era una de las pocas mujeres castas de la epoca. This bronze statue currently located on Suffolk Street, Dublin, whose legend is based on the lyrics of several seventeenth-century songs, where they tell the story of a traveling seafood vendor by day and a prostitute by night, whose family had been dedicated to traditionally fishing; contrarily also it was said that it was a fisherwoman who sold with a cart full of cockles and mussels and was one of the few caste women of the time. For the next opportunity I will introduce you to other sites. Y los duendes existieron o no? Lindas imagenes amigo @felixmillan. Mi apoyo al #TOP3. Se y estoy convencido que algún día voy a esa ciudad.